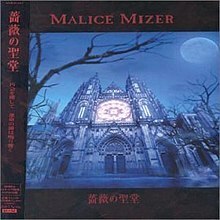 Bara no Seidou (薔薇の聖堂) is the fourth and final album by the Japanese visual kei rock band Malice Mizer, released on August 23, 2000. The title roughly translates as "Church of Roses" or "Sanctuary of Roses". In February 2007, Bara no Seidou was re-released by German record label Trisol Music Group, packaged in both jewel case and limited slipcase versions, both including the Cardinal music video collection DVD. Bara no Seidou is a major change from Malice Mizer's previous albums with less of a focus on the twin guitar sound that was present in their previous discography, but retaining a chameleon trait like artists such as Genesis and Roxy Music. The band's sound switched from a normal art rock sound into a dark, gothic metal one; however, they still continued to use the violins, harpsichords and other instruments present in their older works and also added in a pipe organ and a choir for a haunting, melancholic, and religious feel to the album. For example, the song "Seinaru Toki Eien no Inori" is based around an organ and choir but still includes dual guitars and drums, which gives it a gothic metal feel. Fan favorite "Kyomu no Naka de no Yuugi" is a track that uses an organ and harpsichord mixed with a synthesizer and drum machine for more of a dark wave element. This song is influenced by gothic rock/industrial music and features a different image in its video, but still retains the dark themes of the album. The band released the DVD Bara ni Irodorareta Akui to Higeki no Makuake of their two-day live concert at the Nippon Budokan. Like their previous tour, "Merveilles L'Espace", this tour was very theatrical, having a Gothic cathedral on the cover of the album as a stage prop and a moon that changed colors several times during the performance. However, unlike the previous tours, it did not completely consist of the members playing their instruments and relied more on the theatrics. All tracks written by Mana, except tracks #4 and #7 by Közi. Kami – "eternal blood relative"
^ The song "Saikai no Chi to Bara" is a longer version of the song "Saikai" from the EP "Shinwa", dedicated to the deceased Kami. This page was last edited on 10 February 2019, at 17:42 (UTC).